How did Emily Burke become one of the most successful real estate agent/brokers in Clinton? Eight years ago, Emily decided to take the leap and follow her dream to become a real estate agent. Now at 29 years old, and with almost a decade of experience under her belt, she’s the broker/ co-owner of Golden Valley Realty Group, LLC, whose slogan is “Converting transactions into relationships.” Phone 888-461-3930 | Fax 310-751-7068 While Emily is still a youthful presence in the industry, she’s also a leading agent, serving Clinton, Truman Lake, mag@topagentmagazine.com | www.topagentmagazine.com Lake of the Ozarks, and the surrounding areas. Emily both No portion of this issue may be reproduced in any manner whatsoever consent ofarea the publisher. coverswithout a largeprior geographic and takesTopa Agent wide variety of Magazine is published by Feature Publications GA, Inc. 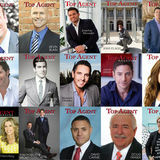 Although listings precautions are taken to ensure theland, accuracy of published including commercial, residential, and multimaterials, Top Agent Magazine cannot be held responsible for opinions expressed or facts supplied by its authors. family. “To succeed in a rural area, I have to have my hand To subscribe or change address, send inquiry to mag@topagentmagazine.com. in it all,” she says with a smile. 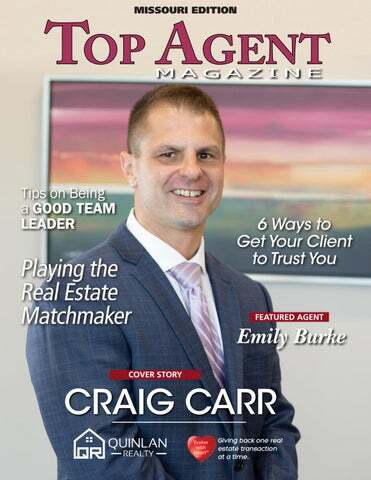 To learn more about Craig Carr email CraigCarr@QuinlanRealty.com, visit QuinlanRealty.com, or call (314) 401 – 9286 www.